2. LM 3915 Scale Logarithmically and span 0dB to 30 dB in ten 3 dB steps. Used in signal strength measurements. 3. LM 3916 Internal resistors related to semi-log fashion to simulate VU meter. Pin connections are same in all ICs. Pin 5– Signal input. Each LED from pin 18 to pin10 lights at the increment of 125 milli volts in the input. Pin 6– High end of the internal resistor chain. Pin 7– Voltage reference output. 125 milli volt if pin8 is connected to 0 rail. Pin 9– Mode selector. Dot mode display if not connected. Bar mode display if connected to positive rail. Pin1– First LED lights at power on. Represents 0 dB. Pins-18 to 10 LED connectors. To reduce signal to the input, a variable resistor is needed. Otherwise all LEDs will light (in bar mode) or turn off (in dot mode). If the input is not connected to the 0 rail through a preset or resistor, Last LED at pin10 will lock on. 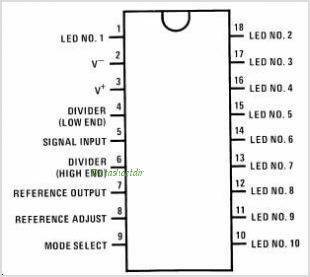 Input voltage to pin5 required to turn on last LED (pin10) is equal to the reference voltage applied to pin6 (high end). 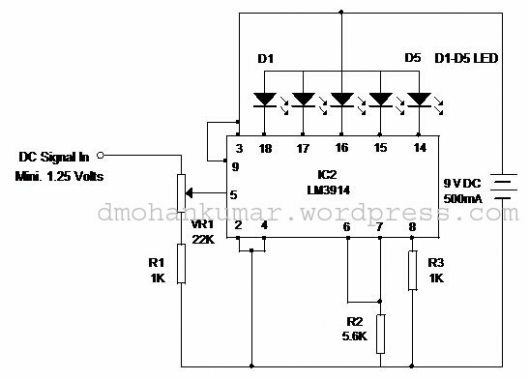 The input voltage required to turn on first LED (pin1) depends on the voltage applied to pin4 (low end). But the limitations are pin4 cannot be taken below 0 volt and pin6 1.5 volts below the supply voltage. Basic sensitivity of the IC is set by connecting pin 6 and 7. So that the input voltage required to turn on last LED (pin 10) is 125 milli volts. The low end (pin4) of the resistor chain is connected to the negative terminal of the reference (pin8) pin through 0 rail. So that the input voltage required to turn on first LED (pin1) is 125 milli volts. In this state, each increment of 125 milli volts turns another LED on. 2. By connecting pin 8 to 0 rail. So that reference voltage at pin7 can be increased. If a preset (10K) is connected between pin8 and ground, the sensitivity can be adjusted. 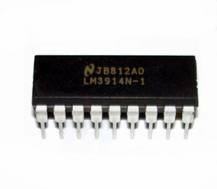 Absolute maximum power dissipation of the IC is 1365 mW. So when using for bar mode display, total dissipation should not exceeds 600 mW when all the LEDs are on. Light output of LEDs varies considerably.” High bright LEDs” certainly produce a vivid display, but this is achieved only when the current level is 20 mA or more. It is better to use ‘Low current’ (2mA) LEDs. 3 mm LED is better than 5 mm LED. Transparent LED gives better display than the ordinary types. If low current LEDs are used in dot mode display at 3 volts, better display can be obtained by increasing the value of programming resistor to 10K. The real story has begun! Thanks n regards.